(Please excuse the grey ish tone to my hair caused by dry shampoo, and the squinty face from the sun!) 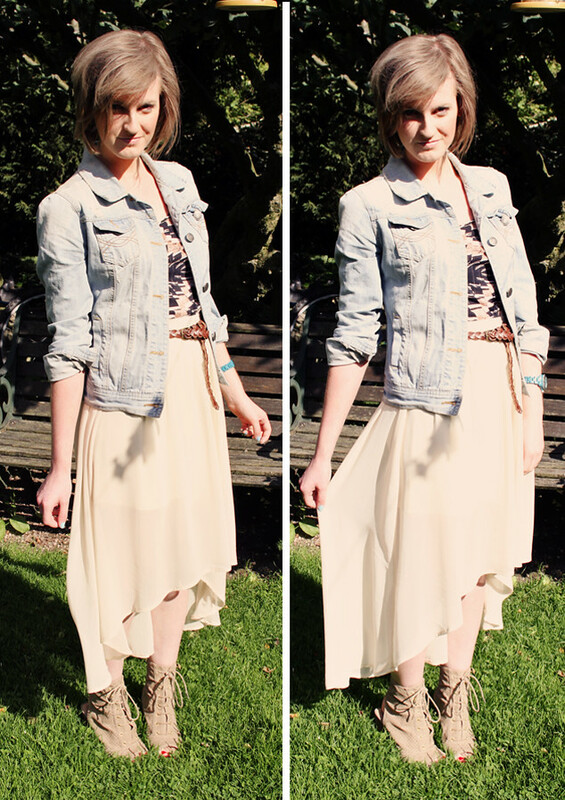 Dan bought me this skirt a few days back for our holiday, but I couldn’t resist wearing it. Its such a lovely cut and floaty chiffon fabric. Perfect for sunny days. I didn’t pick up much when we went out. I got a bikini top in the Next sale that’s gorgeous. Its a blue bandeau with brown beading. I’ve got some bottoms in pretty much the same colour so I’ll be pairing it with those. Also got a sheer jumpsuit/beach cover up thing from Tesco, but when I got it home and tried it on, it looks horrendous on me so I’ll be taking that back tomorrow. I’m counting down the days (33!) until we go to Rhodes at the end of next month. I need a holiday! Where are you all going this year? Have you got any holiday sale bargains? "FASHION, ART & TEXTILES EVENTS IN PRESTON"
You look gorgeous – I want that skirt! So jealous you'e going to Rhodes too! Oh, I have those days. It's weird, isn't it? I'll wake up and feel depressed for no reason. Perhaps it's just hormones, haha. The perks of being a woman! Great outfit, I really love your skirt. So summery! i really love the vest and skirt, there both gorgeous!